These places are really struggling with economic burdens in non-Buddhist countries where they have no discounts, no benefits and no supportive framework other than their home countries which let them figure it out on their own, we should support them in their efforts to stabilize Buddhism here and elsewhere. They are acutely aware of us Westerners and want to help us learn Buddha dharma but can’t figure out how to get us to stick with our training or even to come back for more training and community. They can’t get many to behave like traditional Buddhists – knowing by seeing some squeal like piglets, get really defensive and mad and start spouting when asked for donations or even “gasp” at being charged fees. Many elders just give up, it’s too hard and too time consuming to bear with the outbursts and the result is not encouraging. For westerners to do this means we get lower grades of teachers who barely want to spend time with us, why should they, we give them no motivation…no respect… no practicing, not asking for dharma teachings and providing a place for it to happen, always complaining, not giving dana just using up temple money and space. so selfish that is, even I don’t want to bother with those who aren’t really sincere. Most are not even gaining access to the really deep teachers of dharma in this way. Shaking heads happen and confusion of stories about such and worse behaviors by my fellow Americans can’t seem to just grow up in this one area of modern life when I broach this topic among my elders. It’s pretty darn shameful to find out my fellow country people are cruel, vindictive tightwads when it comes to supporting Sangha and the temples. 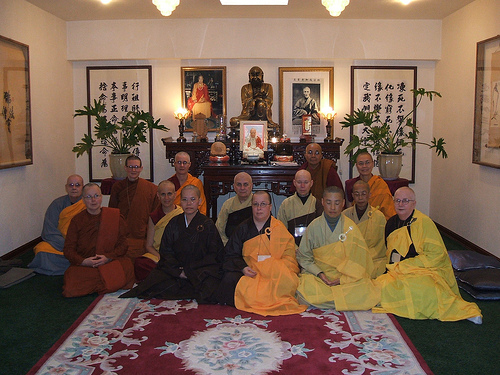 In fact, these tightwads, call themselves dharma bums, create cutesy blogs and write books and sell dharma items, charge fees of their own for classes and books on Buddhism and are always looking out for places that will let them sponge off the sangha and the resident community that actually supports the temple and the monastics. They have organized online forums and poo poo the thought of fees and offering dana let alone regular financial support. It’s pretty bad. They use innuendo, abuse, anger, defensive slander, make outright accusations regarding sangha morality and all to save their own pocketbooks. They use up thousands of dollars of Sangha resources to further their own goals which are usually based in financial gain. Sickening. They often pout and start claiming sangha is polluted for being open about needing money to survive on. Then they engage in gossip spreading it out in the unsuspecting community at large implying yet another immoral group is after their almighty precious dollar! And spouting phrases like “how dare they!”, “wonder what they are really up to? !”, etc. They spout vindictively and say ‘dharma is free!’. Implying that ‘free’ is by Buddha’s blessing, and that’s a falsehood. Well it was never a matter of ‘free’ for the Buddha who was not doing things for nothing, it was a matter of having a benefactor to support dharma teachings by providing a place, food, and alms for the Buddha and his disciples. Temples carved their donors names on the walls, there were stele’s recording temple financials including inventories. Much boring ancient recordings have been found in ruins and old places of numbers, names, and places in almost every country where Buddhism is well established. It has always been that way. Nothing is free. Nothing. People with this attitude can be a little more reasonable and mature in approaching to these traditional dharma places and see how they can contribute to meet their needs and contribute to help temple to survive and remain open at all. Westerners need to understand temples are operating on the edges of dharma borders particularly here in the USA. In fact, these temples and monasteries are the dharma borders or serve as an oasis if you prefer. We need to preserve our oasis, so please donate funds so temples can remain.